As much as I love design and patterns, and fabrics and the fun and fluff... every once in awhile I come across something that reminds me that sometimes, simple is best. This photo from of the Carlin Home from Traditional Home is a great example of just that! With a plain and understated backdrop, each individualy piece has a chance to shine. Do I need to say anything about that light fixture? It clearly is the focal point and lets you know that even though this room appears simple, it's certainly not short on style! A white slipcovered couch can work in any space. I'm a big proponent of having some "grown up" seating in a playroom. 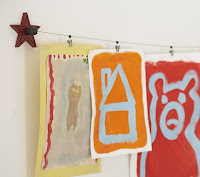 Children's Art. When looking for artwork for a child's space, there are a ton of options out there, just browse etsy! But sometimes, the best ones are created by the little artists in your own home. Throw them in a Ribba frame from IKEA, and you have instant, beautiful and meaningful art! When putting together a child's space, here are a few things that I try to remember. Lighting. No one likes to be in a dimly lit room, especially kids. If you want to create a warm, fun space where your kids will want to stay and play, make sure there's good lighting. The use of ceiling lights and wall lights are great because they eliminate the possibility of anyone touching them and or anything tipping over. Seating. Chances are there will be plenty of adults spending time in this space too. Don't forget to include comfortable seating for the "big kids". Their grandparents will thank you. :) And it's always nice to have a place to be able to cuddle and read books. Display. 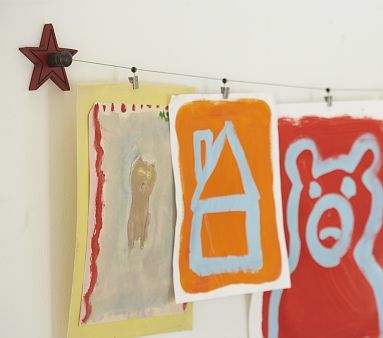 Every child love to see their work displayed, even if it is the simplest of projects or drawings. It's tempting to fill up every wall with artwork or decor, but don't forget to leave room for future projects. You can do this bulletin boards, frames, or these great art cables too. This ones from Pottery Barn Kids for $39, but you can also get IKEA's curtain wire for under $20. Click here to see more photos of this beautiful home.